Capital is the money that a company uses to finance its business. For example, in buying assets for operating the business and investing in projects that generate cash flows for the company. The capital can come from investors who invest in the common stocks of the company or from funds borrowed from others known as debt. The cost of capital can be thought of as the cost of doing business. Imagine if the company uses only common stocks (equity) to finance all its assets, then the stockholders will own all the assets and all the cash flows generated by the business. The investors will be expecting a certain rate of return for putting money into the common stock. The cost of capital in this case can be thought of as the required rate of return by the investors. When the company needs to invest in a new project, it may need to consider whether the returns will be able to meet the expectations of the investors. To complicate matters, most companies use a mixture of debt and equity to finance their business. Thus cost of capital involves a mixture of the cost of equity and the cost of debt. In this case, the cost of capital for a company is the required rate of return that the company needs to earn in order to pay the debts and to meet the expectations of the rate of return required by the investors. Weighted Average Cost of Capital is defined as the average cost of capital for a company, calculated as a weighted average of the costs of equity and the costs of debt. 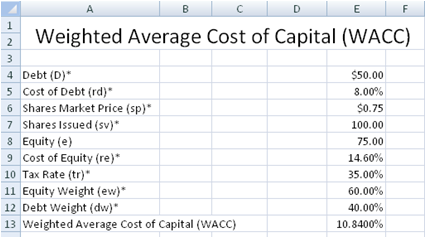 The WACC Calculator spreadsheet uses the formula above to calculate the Weighted Average Cost of Capital. The Cost of Equity is defined as the rate of return that an investor expects to earn for bearing risks in investing in the shares of a company. Two common ways of calculating the Cost of Equity is the Dividend Growth Model by Gordon and the Capital Asset Pricing Model (CAPM). In the Dividend Growth Model by Gordon, the price of a company stock is calculated as the sum of all the company's future dividends. The dividends are assumed to be growing at a constant rate. The Required Return is the Cost of Equity and this is calculated in the worksheet CostofEquity-Gordon. 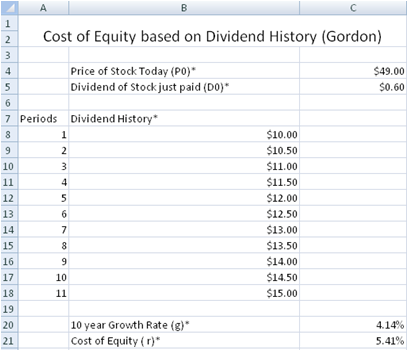 In the CostofEquity-Gordon-DivHistory worksheet, ths Cost of Equity is calculated using the same formula as mentioned above. The Growth Rate is however estimated from the Dividend History. The Capital Asset Pricing Model is a theory that describes the relationship of the expected rate of return as a function of the risk free interest rate, the investment's beta, and the expected market risk premium. The Expected rate of return is the Cost of Equity and this is calculated in the worksheet Cost of Equity (CAPM). A company's debt is usually a mixture of loans, bonds and other securities. A company's Cost of Debt is the interest rate that a company pays on its debt. It is important to note that the interest a company pays is a tax deductible expense. Thus the after-tax rate is usually used for a company's cost of debt.